The Welsh government has confirmed its commitments to achieving its goal that the ecological footprint of the whole of Wales should be reduced to its fair share of the planet’s total ecological footprint within a generation – taken to be by 2050, and to using ecological footprinting as a means of measuring progress under its ground-breaking legislation, the Well-Being of Future Generations Act. The renewed commitment is stated in a response to a freedom of information (FOI) request concerning the status of ecological footprinting made by David Thorpe, a patron of the One Planet Council and author of the book The One Planet Life. The response links to a 2015 update on Wales’ ecological footprint as a downloadable PDF on this link. 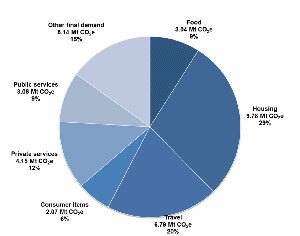 This puts the ecological footprint for Wales at 3.28 global hectares per capita – or the equivalent of 2.5 planets. 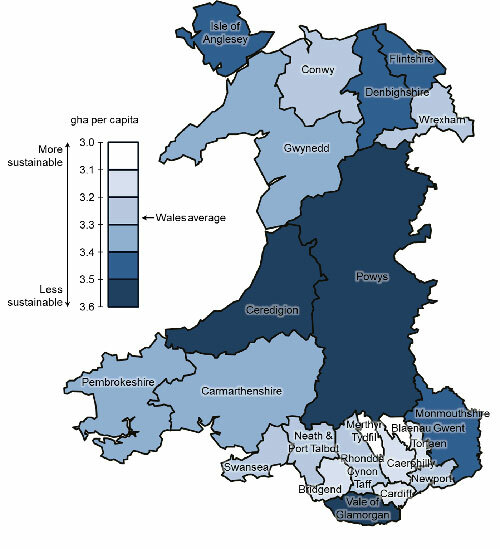 The update ranks Welsh counties on their individual ecological footprints and carbon footprints. 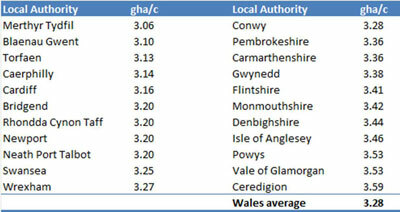 The top three local authorities with the highest carbon footprint are: Ceredigion, Powys and Isle of Anglesey. Anyone applying for planning permission for a ‘One Planet’ Development in these counties might argue that they are helping the county to lower its ecological footprint in line with the needs of the Well-Being of Future Generations Act. The counties with the lowest ecological footprint are: Merthyr Tydfil, Blaenau Gwent and Caerphilly. The report also calculates the carbon footprint of Wales and its counties so that the two ways of viewing environmental impact can be compared. 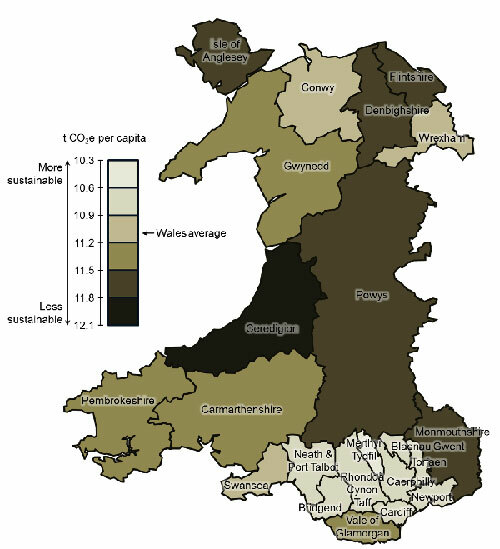 Where does Wales’ ecological footprint come from? In other words: consume less. Well, no surprise there. Translation: our footprint is going to have to get even smaller. The full FOI request and response is here, and reproduced below. The Well-Being Of Future Generations Act requires Welsh Ministers to promote sustainable development and publish national indicators to measure progress towards the achievement of the well-being goals, and take account of United Nations Sustainable Development Goals, the UK’s assessment of the risks of the current and predicted impact of climate change and report their progress every year. The accompanying Technical Note provides details on sources of information for each of the indicators. But it is not clear in the legislation’s Technical Note how or by whom the data for indicator 14, The Ecological Footprint of Wales, is to be calculated. This is the only indicator for which the Note gives no source, existing or planned. Ecological footprinting is a quantifiable but complex process which the Act has in common with One Planet Development as defined in TAN 6 and its accompanying guidance. The Act’s Technical Note observes that ecological footprinting is also a proposed indicator 12.2.1 by the United Nations Economic and Social Council (December 2015) to assist in measuring the target to achieve the sustainable management and efficient use of natural resources by 2030. I was told by Cathy Madge, Head of Engagement and Partnerships, Future Generation Commissioner’s Office, at an event I attended on 21 September 2016 at Gorseinon, that indicator 14 had been abandoned. Yet it is enshrined in the Act. Also, the document One Wales: One Planet (2009) contains a goal to “Stabilise the public sector’s ecological footprint by 2020, then reduce”, and a further goal to “Within the lifetime of a generation… see Wales using only its fair share of the earth’s resources.” The headline indicator for this goal is given as: Wales’ Ecological Footprint. Supporting indicators are given as: Total Resource Use, Greenhouse gas emissions, Waste arisings, Household waste recycled or composted, and Mobility. 3) the status of the goals contained in One Wales: One Planet. Thank you for your email of 4 November regarding the role of ecological footprinting and the Well-being of Future Generations (Wales) Act 2015. I apologise for the delay in replying. The 46 indicators will enable the Government, Assembly Members and any citizen in Wales to find out what progress in being made at a Wales level in achieving the seven well-being goals. We will report annually on the national indicators where data is available, but it will be the case that not each indicator will be available annually. National Indicator 14 uses the ‘Ecological Footprint of Wales’, which is an indicator of the total environmental burden that society places on the planet. It represents the area of land needed to provide the raw materials, energy and food, as well as absorb pollution and waste created and is measured in global hectares. As with some indicators this would be reported on a periodic basis. Historically Wales has used the Ecological Footprint as a measure of whether Wales is developing in a more sustainable way, and remains a useful tool in explaining the concept of a ‘One Planet Nation’. You rightly acknowledge that this can be complex, and we recognised this as part of the development of the national indicators set. On balance, the Government took the view that an Ecological Footprint remains a useful proxy for whether Wales is developing in a sustainable way. There is no current intention to review the national indicators, and therefore National Indicator 14 will remain as part of the set. The reference to the work by the United Nations Economic and Social Council proposal was provided as a contextual indicator to aid future analysis. Further information on the approach taken by the United Nations to measuring the 17 Sustainable Development Goals can be found here http://unstats.un.org/sdgs/. In your email you also refer to climate change and so I would draw your attention to Indicator 41 which covers the emissions of greenhouse gases within Wales, this will be reported on through two ways, (i) emissions from what we produce in Wales, and (ii) a footprint basis of Welsh consumer emissions which will be reported every 5 years. This ensures alignment with the Environment (Wales) Act 2016, and complements indicator 41 on the ‘Ecological Footprint’. • Find out more about – and buy – the book The One Planet Life.